We are not in any way experts on parenting children with disabilities. Our goal is simply to share strategies that have worked for each of us in the event it may help those in a similar situation. If you’re different from us (i.e., you are bright or of the perfect persuasion), we advise you not to try the following at home. On a “perfection-preoccupied planet,” sisters Gina and Patty dare to speak up about the frustrations, sadness, and stigmas they face as parents of children with disabilities (one with Asperger’s syndrome, the other with bipolar disorder). 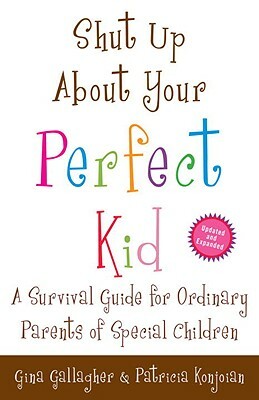 GINA GALLAGHER is a highly imperfect mother and an award-winning copywriter. She lives in Marlborough, Massachusetts, with her husband, two daughters, and countless carpenter ants. PATRICIA KONJOIAN is a freelance videographer who lives in Andover, Massachusetts, with her husband and three children. She has been on a diet since 1978. "One of the best parts of the book is that these two moms sound like...well, two moms. And two very funny moms at that. So you’re going to laugh (a lot), and cry (a little), and you're going to hope for the best, and you’re going to pray that someone can help their kids, and best of all you’re going to know that you’re not alone. So if you were hoping for a dry, predictable reading experience, I’m quite certain you’ve selected the wrong book. Kids with social, emotional, and behavioral challenges aren’t dry and predictable, so hang on to your hat and bring along some tissues."